Appetizer - How many times per day do you usually laugh? Lots of times! I'm always making silly jokes, or making other people laugh with my childish antics. There's nothing better for me than changing somebody's face by doing something silly. Even better if it's a kid! Soup - What do your sunglasses look like? 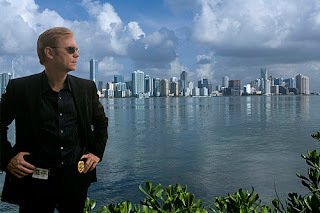 My reading glasses are very traditional; but I like my prescription sunglasses, because they look like the ones Horatio Caine (CSI:Miami) has. Sometimes I even stand sideways like he does! Salad - You win a free trip to anywhere on your continent, but you have to travel by train. Where do you go? Main Course - Name one thing you consider a great quality about living in your town/city. I love living in Waterloo. This is definitely my place in the world. There are many things that I love about it: multiculturalism, one of the top IT places in North America, lots of arts & music events, close to Toronto, Niagara Falls and three of the 5 Great Lakes, two good universities, etc. etc. etc. But the thing that I love the most about this place, what I think it's its greatest quality is the quality of life: it's neither a big city, nor a town, yet you get to meet people on the streets. And no matter how bad your day was, you drive for 10 minutes and you're in Mennonite country, where you don't see anything but green -or white!. Dessert - If the sky could be another color, what color do you think would look best? Purple, because it's both mine and my daughter's Carolina favourite colour. It'd be cool! 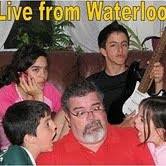 I always have to laugh about the fact that you also live in Waterloo ! 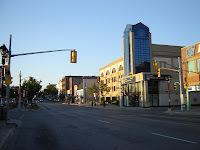 Besides the location my Waterloo has the same quality of life and on top it is very international ! In our Waterloo museum is a world map which shows all Waterloos in the world. There are 53 ! wow..such a wonderful feast you have! thanks for dropping by my blog! I really enjoyed that post, thank you for that! Great feast!! Waterloo sounds fantastic!! I may have to visit some day!! Have a great day! your soup's enticing har-har. i'm interest in your salad. thanks for sharing. Wonderful feast! I love your childrens' names, they are beautiful. Going to Nova Scotia via train sounds like it would be gorgeous! Happy Friday! Come join my feast. Okay, I'll go to Vancouver! I mean since it's free- heehee. :D My dessert was a toss between pink & purple. Have a great day!! Horatio - my next husband! Hoy recibi un obsequi que creo proviene de tu ciudad... Waterloo... Luego posteo.. Recuerda que el domingo toca chequeo de peso y porcentaje de grasa corporal..!!! I've been researching my genealogy and have discovered that one of my great-greats was born in Nova Scotia... so now I want to go there even more. I've always wanted to go, but now there's a better reason. Keeping my fingers crossed. Hey!Purple is nice.Thanks for the visit. I like the chili bread in the first post! Great feast by thew way! Now that made me laugh, you posing like Horatio with his sunglasses neatly perched on his nose hehe Good one! I am glad that you laughed a lot and enjoy making others laugh too. I am smiling widely at your description of standing sideways like Horatio Caine.